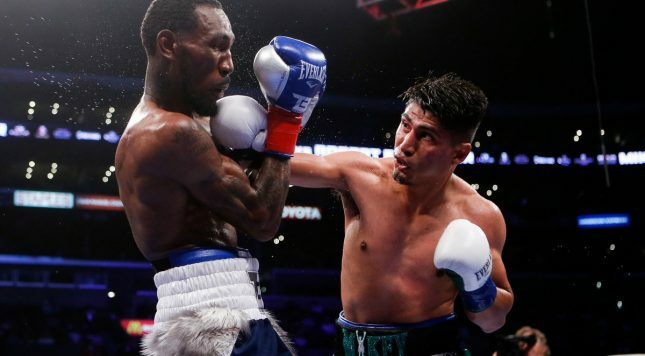 For just a little while — about two and a half rounds, let’s say — it looked like Robert Easter might give Mikey Garcia some trouble all Saturday night long. But a Garcia knockdown in the 3rd, and a thorough takeover by midfight, reminded us yet that Garcia is an outstanding fighter. It was a nice bit of lightweight matchmaking on Showtime, and it played out interestingly. Easter gave Garcia some trouble with his length, superior athleticism and game plan, which was to establish an uncomfortable distance for Garcia and make the natural counterpuncher give chase. But after a right hand/left hook combo that dropped Easter, it was clear Garcia’s excellent boxing brain had figured something out. He had to work his jab, not normally one of his go-to punches, and Easter didn’t disappear after that knockdown: He might have won as many as two more. For some reason, though, he game plan fell apart and he started, weirdly, just running in circles in the 8th. He then made a foolish decision to trade with Garcia in the 9th, and while it made the fight fun for a while, Easter didn’t get the better of it. After that, he wasn’t competitive again. Granted, Easter wasn’t likely to win a fight where he was just more active and not landing the showier punches, but it was disappointing to see such a promising effort go sideways. Garcia said afterward he wants to move up to welterweight to challenge fellow sensation Errol Spence. It’s an intriguing idea, even if a Vasyl Lomachenko bout is more desirable, and even if it’s hard to imagine Garcia, who started at featherweight, having enough power (it’s already evaporated some as he’s moved to lightweight, and wasn’t much in evidence when he moved up to junior welterweight) to challenge at 147. But we ought to know by now not to underestimate Mikey Garcia.